clothes and fabric | How can I recycle this? Last September, Karen emailed us about the vast collection of novelty jester hats that her boyfriend had collected at various carnivals and festivals over the years. She wanted to know how she could reuse or recycle them as she hadn’t had much success giving them away. 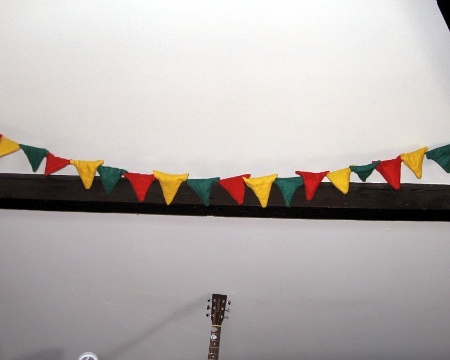 Last year I sent an email about novelty jester hats and of the suggestions was to make a string of decorative pennants, like the kind for birthdays (the upside down triangle). I did this and am pretty proud of the result!! How can I reuse or recycle an acrylic sweater/jumper? We’ve covered wool jumpers/sweaters on the site before now – what to do with them when you accidentally shrink your most favourite jumper ever in the wash. But what about acrylic jumpers? They don’t get ruined in the same way but cheaper ones tend to lose their shape and look a bit washed out over time. That’s the position I’m in now with a few things from before I brought in my “at least 50% natural fibres” rule (in practise, it’s usually a minimum of 80%) – they’re approaching the end of their wearable life even by someone as scruffy as me. Since they can’t be felted (either accidentally or on purpose), they can’t be used for a lot of the same reuses as wool jumpers – they’re too thin (and anyway, not heat resistant enough) to be turned into a pot holder or something like that, and I don’t think they’d be absorbent enough to be used to make a soakers/nappy covers for babies. If they were prettier jumpers & cardigans (rather than just boring one colour ones), I could use the less washed out ones to make a cushion cover – I love the stripes and matching stripy draught excluder in that tutorial and actually, that’s another idea – I could use the arms to make a draught excluder, stuffed with the shredded material from the body. But what else could I do with them? Have you reused, recycled or upcycled acrylic jumpers in any interesting, practical or fun ways? How can I revamp some plain curtains with recycled/upcycled materials? I have ordinary plain curtains that need to look snazzy. I like the “wacky” type of design,whether it’s adding on old buttons,bits of fabric etc. Any ideas? Many thanks,Janet. I think you’ve already got a few good ideas on there: cover the bottom quarter/third of the curtains with a strip of contrasting fabric and decorate the join with a row of buttons (mmm, buttons on curtains) – or go shabby chic with a whole row/section of buttons and misc (badges, charms, pompoms, bows, rosettes – whatever you can find). Or use scraps of old fabric and yarn to make a bunting design higher up – old patterned clothes or bedding would be fab. I’ve seen curtains that looked like they had tufts/short tassels of yarn every 15cm/6ins or so in lines down the length of them, which would be easy to replicate. Or sew on ribbon/thin strips of scrap fabric to add stripes or wiggly lines – for thicker stripes, this chevron idea is nice and I’ve seen a similar appliqué idea using strips of a design cut from old lacey net curtain. Alternatively, you could make reverse appliqué patches – cut out simple shapes and add a contrasting shape/fabric behind to peek through (reverse appliqué tutorial). A simple no-sew idea is to attach ribbon/yarn/strips of scrap fabric to each curtain ring/clip – like the idea (about a third of the way down) on this page. 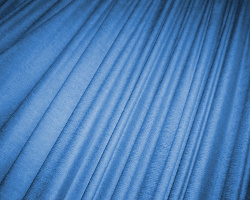 If the curtains are 100% cotton, you could try dyeing them – ombre/dip dye ones would look interesting (as if all the dye from the curtains had slid down to the floor ;) ) – or if they’re too dark for that, selectively bleaching them. (Obviously do try a test patch first.) If they’re too big to be manageable in a dye bath, you could try printing onto them instead (possibly using a linocut technique or an even simpler stamp for something like polka dots — or for a fun or kid-centric room, hand prints ;) ). How would you revamp or embellished plain curtains using recycled/upcycled stuff? What did you do? Have you got any tips or suggestions for Janet? Any non-sewing idea or ones that use alternative materials to fabric/yarn? 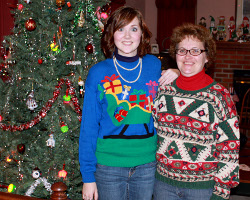 How can I reuse or recycle novelty Christmas jumpers? I got this email from Edie a few weeks ago but I thought I’d keep it until people were thinking a little more festive-ly — I hope it’s not too late for Edie now though! I love silly Christmas jumpers but not to wear, god, not to wear! I’m thinking of getting some to make into Christmas cushion covers but thought I’d ask to see if you had any ideas for making other things from them too and the bits like the sleeves etc. Some of the various sweater-to-cushion-cover tutorials I’ve seen have used the sleeves to make a flap like on a housewife style pillow. Another tutorial suggests making patchwork cushion covers – depending on the patch size/style, that could easily use up all the different bits of a jumper. 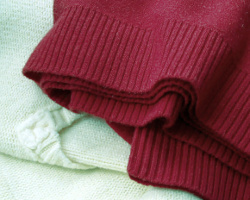 Sleeves could also be used to make hot water bottle covers, with the cuff “hugging” the neck of the bottle. Other ideas for the jumpers: lots of people make Christmas stockings out of old jumpers – the sleeves might be enough for that too. Could they also be cut up to make Christmas placemats or pot holders? If they’ve got a high wool content, they could be felted for extra heat protection (although that would probably distort the pattern). Or how about a skirt for the Christmas tree if it’s in a pot? Any other suggestions for Edie? How can I reuse or recycle pretty synthetic lingerie? Over on The Really Good Life, we’re in the middle of a decluttering month, with the hope of developing a general habit of asking “do we need or even want this?” rather than getting blind to things that have been on shelves for years. I’m also setting a weekly mini-challenge to focus our attention on specific areas: this week has been often overlooked spots in the wardrobe. We remember to sort through our shirts or jumpers regularly, but what about smaller things? As I’ve already said, I got rid of a whole load of old trainer socks a couple of months ago. Around the same time, I also got rid of about twenty pairs of old knickers that had been cluttering up my underwear drawer – ones that no longer fitted properly or I didn’t like the style any more, but previously couldn’t bring them to throw them away because … well, I’m not very good at throwing anything away. The other day, as part of the mini-challenge, I continued on that theme: I got rid of some old tights (well, moved them into my craft stash for some reuse), put aside some barely worn bras for eBay, sent a couple of pairs of unworn pyjamas to the charity shop and found a few “silky” things – pretty camisole sets – from years ago that I no longer wear. It’s all made out of synthetic fabric too, so even if I could fit into it now, I wouldn’t be able to wear it because synthetics make me sweat unattractive amount of sweat and that’s not a good thing with lingerie! One set still had the tags on it (sigh) so I’ll give that to a charity shop as they should be able to sell it on but I don’t know whether they’d be particularly interested in the rest, so I’m imagining it might be better to think of other reuses for them. The fabric is all light & floaty: some opaque, some lighter than that and some are patterned, others plain black. I very much like some of the abstract floral patterns – which is why I bought them in the first place – but they’re too light and flimsy for the type of crafts I usually do (I’m all about the practical these days and I don’t think they’ll make a very good shopping bag or anything like that). I could just add them to my fabric stash on the off-chance I’ll need them for something in the future, but that doesn’t seem very in the decluttering spirit, just shifting the problem somewhere else! So any ideas for reuses? Know of any specific craft projects that would make it worth my while keeping them in my stash? Any more practical reuses?